When I initially created and released my Apps for Social Skills and Autism list, I missed placing a great application on the list. Was it because it was released about two weeks before my list was released or was it because the application was Australian and I live in the United States? Either way, it missed the first boat, but I will not forget to include it on an updated list. 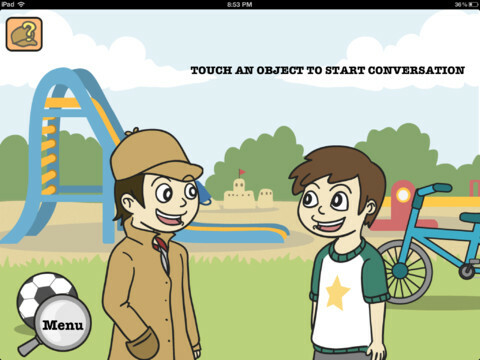 This application that I am talking about is Emotion Detective, perfect for children who are working on social skills and specifically emotions. Read more about the application in my review below. I was contacted via Twitter by the developer of the application, Brooke Purslowe. It was probably one of my first direct messages via Twitter as I am definitely new to the whole Twitter scene (unlike many of my readers). Once I heard the name, I knew it would be perfect to try out with my students and review! 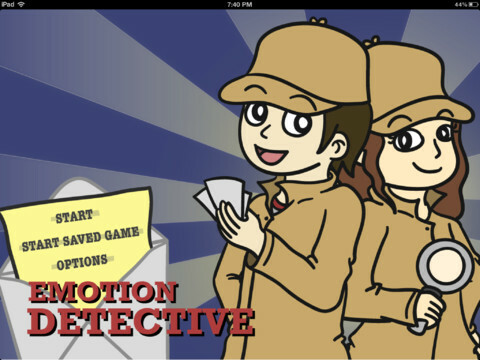 When you open the application you are greeted by the narrator stating "Welcome to the Emotion Detective" followed by a screen with two child detectives on it. The developer of the application told me that the narrator has an Australian accent throughout the application, but I feel that the narrator was understandable throughout. There are three options: Start, Start Saved Game, and Options. The only option currently is to turn the background music up or down on a scroll bar with a man running. This will depend on the child you are working with. I turned the music down so that it would not be distracting during gameplay. The other button on the "Options" menu is the InGenuis Labs icon. Upon pressing this button, a short description of the company will appear and the current version of the application will also be stated. If you have any previously saved games by a child, you can view them on the "Start Saved Game" list. This list will show the users' photo, name, how many cases out of four they have completed, the last time the game was played, when the user started playing the game, and the current case the user is working on. Press the "Start" button to begin a new game and create a new user profile. The narrator will then state, "the people of Emotioniana need your superior detective skills to help solve some curious mysteries that have been occurring around town." You will see a detective badge and a picture frame on the screen with an arrow pointing to it. Press the picture frame to find a user photo to associate with a child's name on the app. You can choose to take a new picture with the Camera or you can choose one from the Camera Roll. After placing an image in the picture frame, the arrow will move to show you where to type your name. Click on the "Detective..." writing in the green box next to the label "Name" to type in the childs' name on the keyboard. The narrator will also state "What's your name, detective?". The childs' name will then appear on the badge. Here's a picture of me on the app. Sorry about the funny looking face :P.
The narrator will describe each case to the student. Upon choosing a case, the narrator will state "Great choice! Good luck detective!" To start the game-play, press the "Next" magnifying glass. Finally, the narrator will state, "You about to embark on an exciting adventure", and you are ready to start the application play! Before I go into the specific game-play of the application, I would like to point out two icons on the screen. One is a detective hat with a question mark. This opens a small "Help" page that gives suggestions to the parent or therapist to help the student work through the application including pointing out the parts of the fact that change with each emotion and discussing what would make you feel that emotion. The other option is the magnifying glass that has the "Menu" label. Pressing this will bring you back to the main menu, but first will show a dialouge pop-up box that asks if you would really like to leave the game due to the fact that all data will be lost. If you wish to quit, press yes, otherwise to continue, press no. Once each image has been shown, a magnifying glass will appear on the lower left hand side of the page with the "Next" label and there will be a clapping sound. Press it to move to the next activity. The screen will now show the previous images on a grid of four and ask the student to identify different emotions by stating "touch ____". This text will also appear at the bottom of the screen. If the student presses the wrong image, the narrator will state the emotion associated with the image. If the student pressed the correct image, the narrator will also state the emotion and a new grid of four as well as emotion to be chosen will appear. The narrator is also great about conveying the emotion in her tone of voice. Once this activity has been completed, the "Next" magnifying glass will appear again and clapping will also occur. Next, emotions shown on yellow cartoon faces will appear on a grid similar to the previous activity. The activity is the same as the child is asked to identify different emotions conveyed on the faces. This time, the child is not shown each emotion beforehand in a photo album format. Once this is complete and the "Next" magnifying glass has been pressed, four boxes will appear with the text to "Take ___ photo". The blank has a specific emotion for the child to take a photo using the appropriate facial structure to convey that emotion. When a box is pressed, the narrator will state "show me ___" with the emotion stated. You can choose an image from the camera roll or take a new image. Once all of the images have been chosen, the "Next" magnifying glass will appear and take you to the next activity. Here I am, practicing emotions! The next screen has you trace parts of the faces you uploaded that change with each emotion. The child must use his or her finger to trace on the screen. To go through each image, click on the image you want to trace on the right hand side. I look really angry with the red around my eyebrows here. Finally, on the next screen, the student gets a break with a search and find puzzle. The child is asked to find different objects on an image. The narrator states which toy to find in a bedroom scene and the image of the toy is shown on the left hand side of the page. A hint button (light bulb) is available to press at any time to help show the area in which the item can be found. The item to be found is usually related to the theme the child chose. After the student has completed this task, a screen will appear to praise the child. The next part of the application has the child identify body language. An image is shown of a child or adult conveying a certain type of body language. The narrator discusses the concept of body language very quickly and asks the child to choose what they might say while conveying the body language shown on the image. The child must select out of three choices what phrase matches the body language shown in the image. The child can hear the text read aloud by the narrator by pressing on it. To choose a definite answer, the child must press "Lock it in" next to the text. If the answer is incorrect, the text will be read aloud by the narrator and the child will not move on to the next scene until the correct answer is chosen. After this activity, the missing item game will play again for a break for the child. The next activity shows two cartoon-drawn children talking. There are objects in the background that the children can talk about and the user is asked to touch an object to start conversation. The children will begin conversing with each other with a pre-recorded conversation. A speech bubble will appear over the person who is talking. The object chosen will also be darkened to show that it has already been selected. Following the conversation, the user is asked to rate how the detective's friend feels after the conversation is complete on a scale of sad, happy, or excited. If you wish to listen to the conversation again, press the "Listen Again" button. If an incorrect emotion is chosen, the narratore will state "try again". After the user chooses an emotion that matches the conversation, he or she can press a new item for the children to talk about on the screen. Items are generally related to the theme or background chosen. Once each item has been found and discussed, the user can move on to the find the hidden object game. 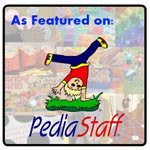 The following activity shows a picture of a child or adult in a certain situation and the narrator will describe it. The user must then infer how the person in the photo is feeling based on the context he or she is given. The face of the child or adult in the image will be blocked out by a square and the child must choose from four cartoon faces at the bottom as to how he or she infers the person is feeling. If the emotion is chosen incorrectly, the narrator will state the emotion aloud and place the cartoon image over the persons' face. The user will not be able to move on; however, he or she can listen again to the description by pressing "Listen Again". If the emotion chosen is correct, the cartoon image will display over the persons' face and then fade to show the real-life photo of the persons' face. A new scene and narration will then play. Once all of the scenes have been completed, the find the missing item game will play again. Finally, the entire application play will be complete and a screen with the objects found related to the theme will appear. The narrator will then wrap-up the game-play by relating the objects back to the "Case" and congratulate the user. This game-play will then be saved. 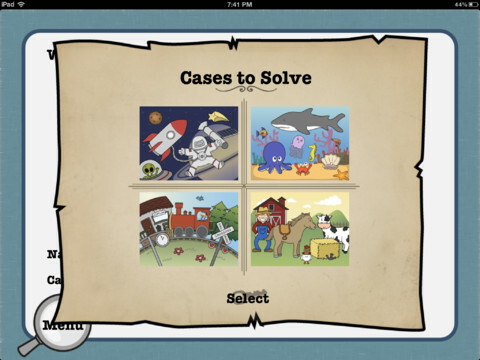 A new case can then be chosen to solve with the same activities but different scenes/images. I don't know where to start about all of the things that I like about this application because I like so many things! I wish I had found it at the beginning of the school year rather than at the end! I love the fact that the user first learns the emotions, then is able to identify them, and then infers emotions of others in real-life images. I like the fact that the user can listen to conversations of others and determine how the conversation went and how the peer felt during the conversation based on what was said. I love the fact that the user can take his or her own image and practice conveying different emotions. Each time the user chooses a new "Case", there are new images of emotions to choose from and conversational scenes so the student will be exposed to emotions in different situations. The narrator conveys emotion in her voice when stating an emotion or conversation. The last thing that I like is that the application has a theme throughout! All of the buttons and narration are related to the detective theme! I would definitely like to see the text able to be restated on every screen. There are a couple of activities in which the user cannot have the narrator restate the directions or emotions. Also, there is no narration for the screen in which a child must press an item on the screen for the children to converse about. I would like the ability to save after each activity. This is due to the fact that if a child becomes fatigued or distracted during a session, it is hard to go back to the beginning another day. The grid of cartoon-drawn emotions does not go through and have students learn them beforehand, and it might be good for them to have that opportunity. When you upload photos for the grid of four images of yourself conveying emotions, the text leaves as soon as an image is uploaded. It would be nice to have each emotion word in text below the image even after each photo is shown. This way if the teacher reviews the emotions with the student at the end of uploading all four, it will be easier to determine which face went with which emotion and if the emotion is appropriately conveyed in the image taken of the student. I would love the ability to focus on different activities separate from playing through a whole case. Maybe this could be added on. This way, students would get extra practice if they are working on a certain problem area (learning emotions, identifying emotions, inferring emotions, etc.). Some of my students are at different levels of learning emotions and this way, we can get more practice in the area of need. This is a rather big request, but it would be neat to have a PDF file attached to print and send home of all of the photos of the people showing different emotions for the child to identify/learn. Doesn't have to have the scenes on it, just the cartoon images and real-life photos of individuals conveying emotions. If the scenes are added to the document, one would have to create a paragraph narrative to go along with it, or have questions to go along with it. It would also be great to have faces for the students to draw different emotions on. This application is available for the iPad for $18.99. That is a great price considering everything that went into this application in regards to the theme as well as the different levels of emotion-related activities. 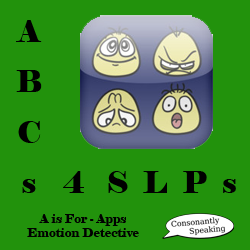 I would absolutely recommend this application the speech-language pathologists, therapists, and parents of children who are working on identifying and inferring emotions! 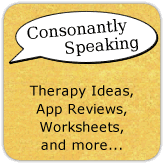 Consonantly Speaking was given an application code by the developer to review the application. No other form of compensation was given.